Australia and New Zealand have created history by playing first day-night Test match at the Adelaide Oval Stadium ( New Zealand ). After 138 years, for the first time, the five-day game was played under lights and for this pink leather ball was used. This match is a real departure from tradition, with the relatively untested pink leather ball replacing the standard-issue red for the first time in a format that dates back to the 1870s. The first day-night test match was the third match of the series between Australia and New Zealand played for 2015 Trans-Tasman Trophy. Traditionally red ball is used for Test cricket. However, it is not as visible at night as during the day. Hence, pink ball will be used at Adelaide Oval. Kookaburra is the manufacturer of the pink ball. 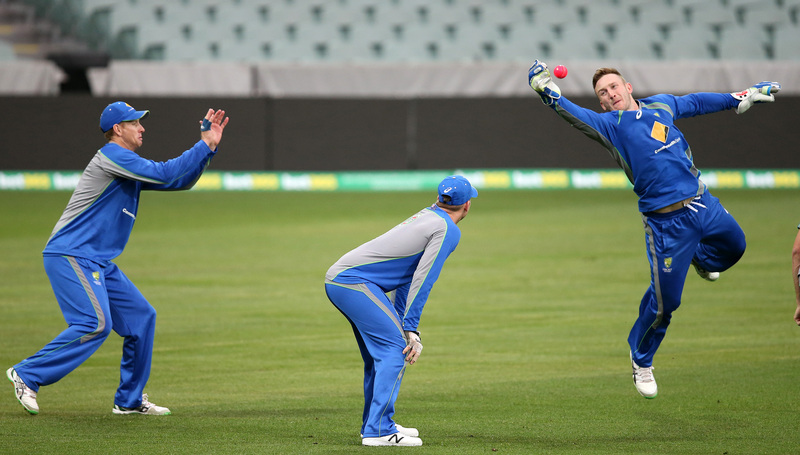 Australia have trialled pink balls in domestic matches and are satisfied with the results. Test Number 2188 has a five-day limit, six-ball overs and a pink ball. Same 6 hours of play was witnessed as in all Test matches. 90 overs to be bowled per day.This match is being played as per recommendations of the MCC World Cricket Committee to keep the long format test cricket alive. To keep the long format test cricket alive the idea to host day-night Test match par with One Day Internationals (ODIs) was mooted by Cricket Australia chief executive James Sutherland. It was approved by International Cricket Council (ICC), an apex body for regulating cricket in July 2015. World Series Cricket, established by Australian media baron Kerry Packer in the late 1970s, revolutionised the game when it threatened to go stale, using the one-day format, a white ball and coloured uniforms, and playing under lights for the first time in order stop the dwindling audiences of longest version of game. With lack of crowds at stadiums for Tests, cricket administrators and players felt day-night matches are the way forward to attract fans back to the grounds the changes in timings of test matches would facilitate audiences to watch live second half of the day’s action of test match on Television in prime time or watch it directly from ground after work. Critics say it won’t be durable enough to last 80 overs because of colour deterioration as it gets scuffed and the white seam will make it difficult for batsmen because of a lack of contrast. There’s also the question of whether the ball could swing considerably more during the moister, cooler evening sessions than it does during the day. Which of the following is true about official match ball of the FIFA World Cup 2014? 2.This is the first FIFA World Cup ball named by fans in a vote. 3.Adidas, the manufacturer of Brazuca, is the official 'Match Ball' supplier of FIFA World Cup since 1970. 4.The two other voting options were namely Bossa Nova and Carnavalesca.